Ready to supercharge contracts in 2019, but can’t convince your stakeholders? More than 80% of commercial contracts are still managed through slow, risky, manual processes - so why is securing investment for contract management software such an uphill struggle? 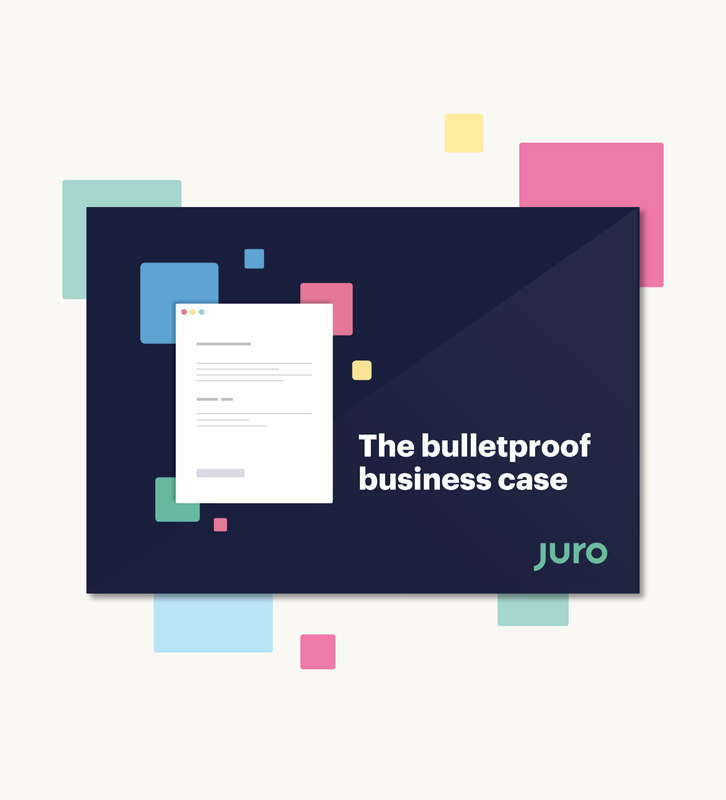 This step-by-step guide shows you how to make a bulletproof business case, so you can get the right people to listen - and to say yes. 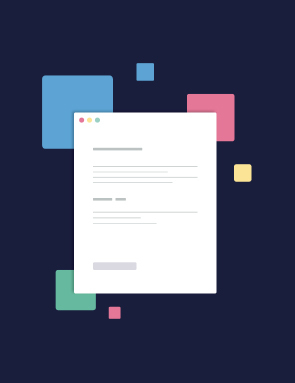 Learn how to sum up your case in an irresistible headline that compels your stakeholders to read carefully, and sells your vision of better processes - and serious ROI. 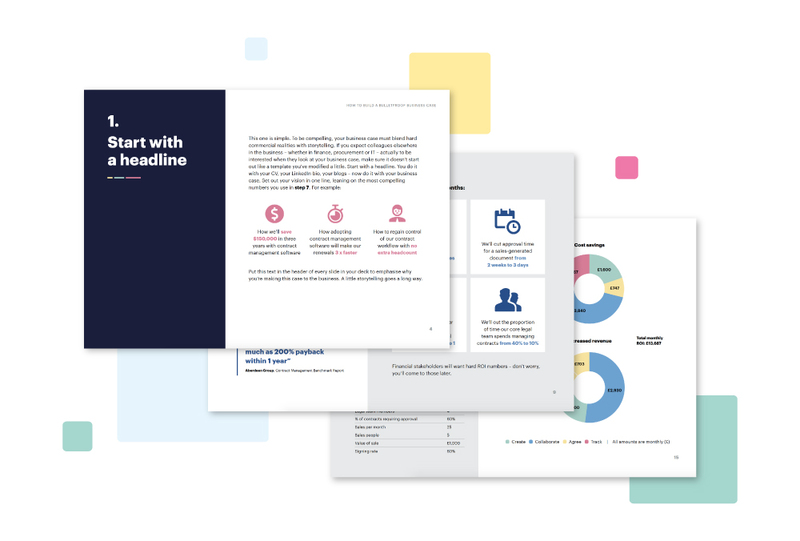 Find out how to explain the pain of your current situation in a way that makes it real for everyone - from day-to-day users at the ground level, right up to company-wide strategy at the top. If contract processes are painful, you aren’t alone in feeling it. Learn how to tell your colleagues’ stories, show the scale of the problems you face, and add real people to the case you’re building. Become a master of storytelling, and set out your vision of a world where contract processes don’t block success. Use aspirational, achievable metrics to reinforce your plan to make contracts the start of something great - not just a necessary evil. Find out how to identify, empathise with and recruit the right allies around the business to your cause. Learn how to tailor your message to land with each audience, and target your request to the right stakeholders. Your plan needs to be succinct, data-driven, and take account of all the individual circumstances of your company. Learn how to focus your message to deliver a decisive plan of action. Without hard numbers that stand up to scrutiny, your chance of success is slim. Learn how to make watertight ROI calculations that show your business the value of your proposal - both in terms of cost savings, and revenue upside. Beyond the dollars and cents, the right solution can have a big impact on less tangible elements, like risk, compliance and user experience. Find out how to push your business case over the top with non-financial benefits your stakeholders can’t ignore. OK but why THIS product? Convince your decision-makers that they don’t just need any solution - they need THIS solution. Learn about the differentiation factors and use cases that will take your solution from a maybe to an enthusiastic yes. Find out how to create urgency, by drawing on the pain points you’ve identified, as well as the ROI you can prove to the business, and get your stakeholders to pull the trigger. If we say yes, then what? Assuage any worries by sketching out your vision of the processes that follow your business case being approved. Learn how to present this as a timeline and let people see the future. Round out your bulletproof business case by showing your readers how the new normal will achieve your vision, and create a world where your chosen solution remains widely adopted and successful. The same objections often arise again and again to business cases for contract management software. Use this cheatsheet to knock them down as soon as they pop up. Set out your presentation to make sure your business case is frictionless, guiding your audience inexorably to agreement.